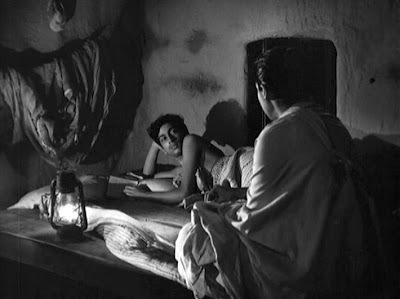 Satyajit Ray’s Aparajito (The Unvanquished, 1956) was the second installment of his highly acclaimed Apu Trilogy, which included Pather Panchali (1955) and Apur Sansar (The World of Apu, 1959) and was based on the writings of early 20th century Bengali author Bibhutibhushan Bandopadhya. 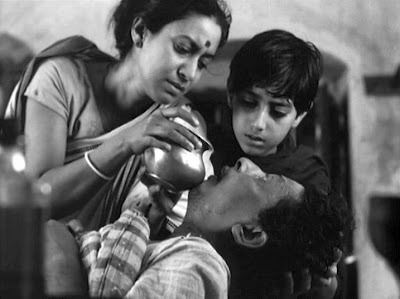 Although the three films trace different segments from the life of the fictional character Apurba Roy (Apu), each of the three Apu Trilogy films can be enjoyed without awareness of or reference to the others. 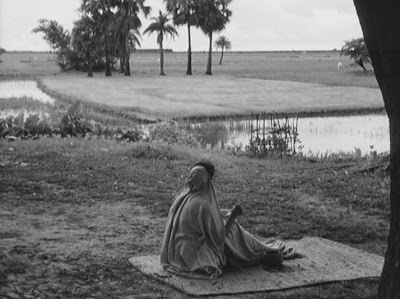 Nevertheless, some familiarity with the earlier events in Pather Panchali can enrich one’s appreciation of the characters involved in Aparajito, so I will add a few comments. Much of Pather Panchali covers the period of time when Apu was six years old and his family lived in the Bengali village of Nischindipur. At the end of that story, Apu’s family home has been destroyed by a monsoon storm and his older sister has just died. 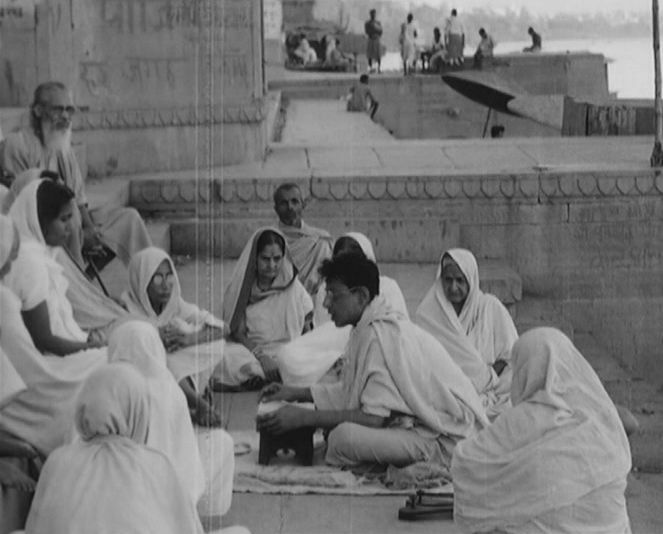 So Apu’s father, Hori Roy, who makes his living as Brahman holy man performing sacred rituals, decides to move the family to the holy city of Benares (aka Kashi and now known as Varanasi). Aparajito begins when Apu is ten years old, and his family has been living in Kashi for several years. The beauty of Pather Panchali is how the interrelationships among those five family members make up a multi-perspective tapestry that sheds light on the human condition in all its wonder. Of those five characters, four of them (Hori, Apu, Durga, and Indir) are lovably innocent and fun-loving, but for various reasons rather unmindful of the practical needs that must be met for their impoverished family to sustain itself. This concern falls primarily on the slender shoulders of the mother, Sarbajaya, who anguishes throughout that film about (a) how make ends meet with no money, (b) how to bring up her children properly, and (c) how to maintain a reasonably dignified status within the local community. But there are still multiple relationships presented in that film that cover not only those practical concerns of how to be successful in the local community but also just how to be. When we get to Aparajito, Durga and Indir have passed away, and relatively early on, Hori dies, too. So the relationship focus eventually narrows down to that between Sarbajaya and Apu. This narrowing down, though, doesn’t impoverish, it enriches – it opens up a dramatic examination of the eternal mother-son relationship, but here in a specifically Indian context. The story of Aparajito passes through three phases that correspond to the separate locales that Apu finds himself in during his teenage years. In the opening section, the viewer is given a leisurely tour of life and practices in Benares along the banks of the holy Ganges river. 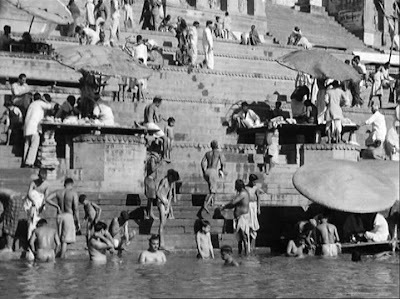 People of all sorts come to the riverside ghats, which offer a wide, open staircase down to the river’s holy waters, down which people can descend to bathe and engage in ritualistic acts of purification. Hori’s priestly profession is to sing and recite holy texts for worshipers who have come to these ghats gain seeking this purification. We are reminded when we see these scenes just how unique and amazing is the Indian contribution to world spiritual culture. Rather than depict and present an angry, guilt-obsessed God who prematurely condemns everyone to eternal damnation (and only then prescribes how one might obtain salvation from this horror), the Indian way is more benign – one must purify oneself before condemning others. You can see this on the faces of the benevolent practitioners on the ghats, who amiably smile at each other, presumably because they don’t see guilt, but fellow spiritual travelers. There are a number of interesting cultural aspects to life in Kashi on display in these early scenes. The common people live in crowded apartments compounds, where many people come and go; so custom requires Sarbajaya either to cover herself or demurely retire to another room when in the presence of non-relative adult men. Inside the apartment compound these encounters happen all the time, so she must constantly be ready to withdraw when another man passes by. There is a touching moment when Hori brings a fellow and equally poor Brahman priest over to his apartment to share a cup of tea. He tells Hori that he is saving up money in order to “buy” a wife so that he can have a real life. In traditional India, one’s social life entirely revolved around the family. Naturally, Sarbajaya must retire to another room when the friend comes to their apartment, but still she must prepare tea for them. She smiles contentedly behind the curtain when she overhears the guest tell Hori that the tea she prepared is excellent. Such are the little joys of social life in the big city. Meanwhile there is no nearby school for Apu to attend in Kashi, so he has become a street kid, playing with other boys in the narrow alleys around his neighborhood. The Roy family seems to be doing OK. However, despite the general belief that the waters of the Ganges are purifying and life supporting, it should be kept in mind that those waters are also biochemically polluted. 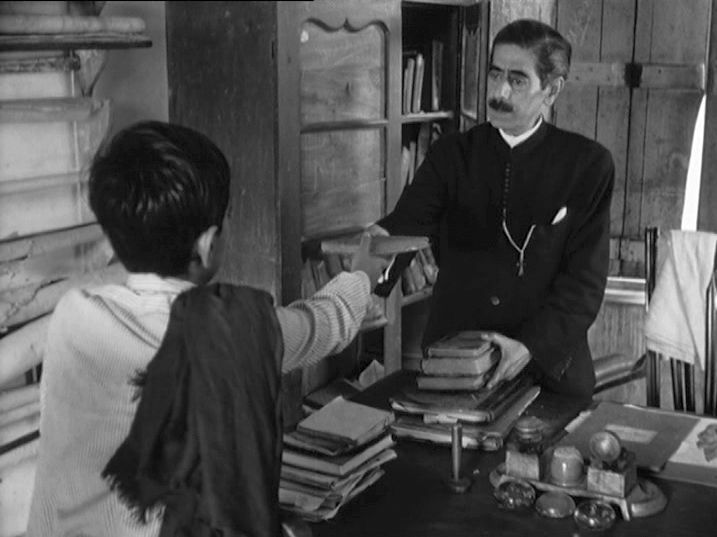 Hori comes down with an illness, and he prescribes his own herbal remedies (this is one facet of his priestly profession) to cure himself. Unfortunately, the remedies don’t work, and Hori collapses the next day and dies shortly thereafter. Now Sarbajaya is left alone with Apu. They take the long train ride back to Bengal, to the town of Mansapota, and come to live in a house owned by a relative. Apu is to be trained to follow in his father’s footsteps and become a Brahmin priest, but he chafes at the ritualistic demands of this profession and longs to attend a nearby school with other boys his own age. Sarbajaya relents to his pleading, and Apu begins attending classes at what turns out to be a very British-influenced school dedicated to a Westernized education. Time passes, and by the time Apu is about 17, he is a top student and is offered a scholarship to study further in the big city of Calcutta (Kolkata). Like most mothers, Sarbajaya is reluctant to let her only treasure leave her for the big city that is some three hours away by train, and they quarrel. But again she eventually lovingly relents and lets Apu have his way. When Apu arrives in Calcutta, he finds an apartment room which to his surprised delight is equipped with electric lighting. He immediately becomes enmeshed in a busy life there, diligently studying science at the college and working in his spare hours at a print shop, and consequently he neglects to write home regularly to his lonely mother. Back in Mansapota neighbors occasionally come to pay social calls on Sarbajaya, but their references to their own family activities only further remind Sarbajaya that her entire family and only meaningful social connection is constituted solely by the ever-absent Apu. Apu does pay her a visit on one occasion, and their encounter is touching, with nuances very well portrayed by Ray. But soon Apu returns to Calcutta and is again embroiled with his life back there. Sarbajaya eventually becomes ill and longs for a visit from Apu, but she is reluctant to jeopardize his studies and force another reluctant visit from him. Apu is eventually sent a letter by Sarbajaya’s concerned neighbor friend about his mother’s illness. Though he rushes back to see her, he is too late – she has already died. At the end of the film, Apu is advised to take up the priestly profession in earnest, but Apu refuses. 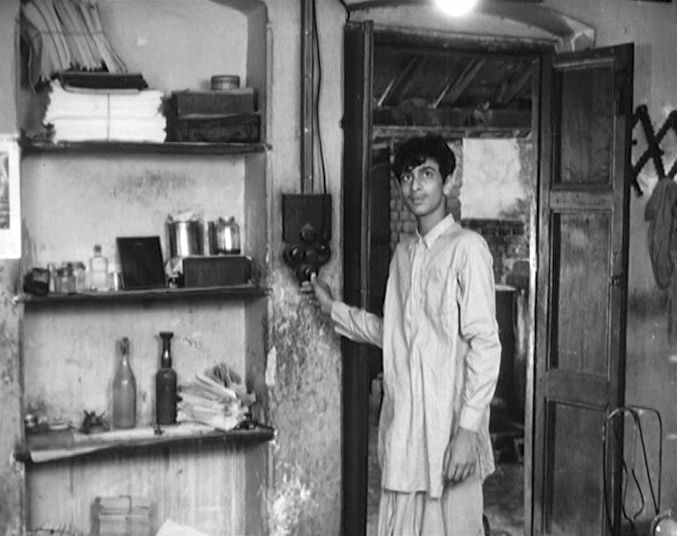 He turns his back on his old, traditional life, and heads back to Calcutta to pursue his new goals towards modernism. Overall, Aparajito has the virtue of offering a leisurely look at various aspects of traditional life in India, as well as the contrasting needs and perspectives across the mother-son relationship. The film doesn’t quite measure up to the greatness of Pather Panchali, primarily because it doesn’t offer the two great narrative sequences – the “Excursion to the Train Sighting” and the “Death of Durga” – which that latter film had and which energized it with compelling dramatic substance. Aparajito relies for its dramatic momentum entirely on the superb performance of Karuna Banerjee in the role of Sarbajaya, which role she had also played in Pather Panchali. Ms. Banerjee’s countenance is so full of suppressed passion and compassion that one could say she would deserve an acting award even if she did not utter a single word. 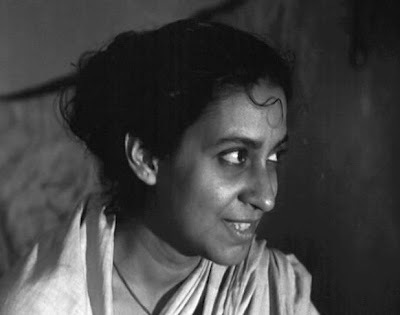 Her role in Pather Panchali was very important there, too, but here in Aparajito, the complexities of her persona constitute the very core of the film. The contrasting outlooks separating Hori (played by Kanu Banerjee, who also reprises his role from Pather Panchali) and Sarbajaya are keys to both Pather Panchali and Aparajito. Hori is mostly optimistic, relaxed, and resigned to his fate. Even when he is critically ill at his very end, he smiles up at Apu and tells him it is OK if he wants to run out and play with his friends. But Sarbajaya is different. While Hori always naively believes in the efficacy of his prescribed home remedies, Sarbajaya remains skeptical. She yearns, but she also doubts and suffers. We feel for her. And over the course of this film, Ray and his cinematographer, Subrata Mitra, expertly compose and weave the story around her looks of longing and love for the boy she knows that she cannot keep forever.